Three of the four main cast of “Blue Love” along with some new faces for m & s Marshall Productions and iFilmGroup filmed scenes for the film which included the final scenes of the movie. The scene took place in the “Baby 4 You” Maternity ward and centred on the film’s lead Helena Rose whose character Kaitlyn Butler has gone into labour. The scenes pick up after she has had the baby in the maternity ward. The scenes also include Kaitlyn’s best friend Paige played by Alex Tremblay and Dylan played by Steven Trevor. The scenes also featured three young ladies new to iFilmGroup and m & s Marshall Productions. All three played women in labour who were in the background of the scenes. They included Lauren Fuoco out of Chatham who played the role April Anderson. A young pregnant mom who is poor and working at a restaurant as a waitress right up to the point of going into labour. That’s where we first see Fuoco’s character as she is brought in by a nurse to the maternity ward. She is part of a number of scenes that were filmed. Fuoco had actually seen the original casting call ad for “Blue Love” when the production team first started looking for actors/ actresses, and she thought about applying but she was busy with school. She is no stranger to acting. She has played Elle Woods in “Legally Blonde: The Musical”, and Veruca Salt in “Willy Wonka and The Chocolate Factory”. Fuoco was also part of the “Tuna Fish Eulogy” put on by the Chatham Kent High School. She played the role of the mother. The production went to the Sears Drama festival in 2015 and won an “Outstanding Production Award” at the District level. Lauren, along with the rest of the cast won an “Award of Excellence- Acting” for the production at the District level. The play went on to the regional level where Lauren won “Awards of Merit- Performance”. The scene also included Talia Mielke who has been a part of a number of theatre productions in the Sarnia-Lampton, as well as Petrolia area. Including playing Anne Shirley in a production of “Anne of Green Gables”. Mielke is looking to branch out and explore her opportunities in acting. She is looking to the future and towards taking the next steps in her life of studying acting in Post-Secondary school. The third pregnant mom was Jessica Windibank from London who is new to acting but has been looking for opportunities. “I live to be a part of something big and creative and want to build my experience”, says Windibank. 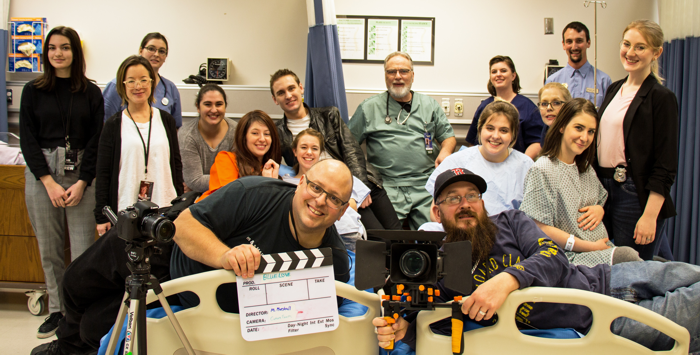 A few of the scenes also included cameo’s by iFilmGroup co-founder Don Hickey and Registered Drama Therapist Angel Bilagot both as doctors. The scenes were simple but a lot of work and detail went into them. Making the filming day long with a lot of hard work and labouring for the cast and the team. “In the end, all the labouring has paid off with a great result”, says the film’s director Matthew Marshall. He is very pleased with the end results that came from the day of filming. “The scenes look great. The cast that was part of them were really good. The overall footage, like much of the film looks really amazing and will make for a great final product”, says Marshall. “Blue Love” is just a few scenes away from wrapping principle filming and heading into post-production. The production team looks to finish filming in the early part of 2019 schedules permitting. “We have a couple locations to nail down and once that happens the filming will wrap up very quickly” adds Marshall. After filming is complete Marshall turns his focus to preparing for a film in the spring to be filmed and also working on some iFilmGroup initiatives.